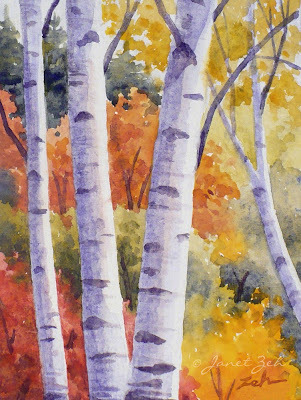 Birch trees are glorious in a fall landscape! These white birches inspired me as I took a walk in the countryside. This piece has an impressionist quality since it was done on handmade paper. Paper Birches print is available in several sizes and can optionally be framed, unframed or printed on canvas. Click the Order Print button below to see sizes, options and prices in my Fine Art Prints Shop.